The redlegged earth mite (RLEM) is an important pest of broadacre farming systems in Australia, New Zealand and South Africa, causing millions of dollars damage to crops and pastures. Chemicals are the most effective and widespread method of combating RLEM. However, the discovery of high levels of resistance to synthetic pyrethroids in 2006 has caused growers to rethink control strategies. 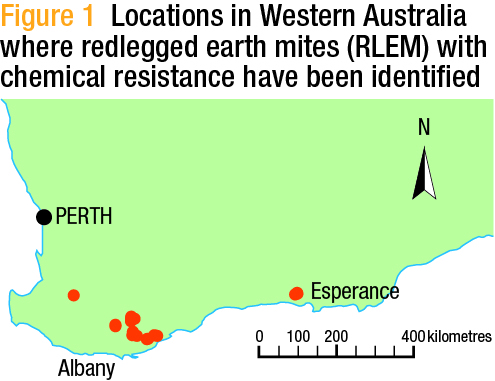 The first demonstrated case of chemical resistance in RLEM was discovered in 2006 in a canola crop north-west of Esperance, Western Australia. Researchers were alerted following multiple chemical control failures aimed at RLEM, which were attacking an emerging canola crop. Four separate chemical spray applications failed to achieve adequate control. High levels of resistance to two synthetic pyrethroids – bifenthrin and alpha-cypermethrin – were found at this site. This resistance has been found to have a genetic basis, persisting after several generations of culturing in the laboratory. RLEM from a single field site have also been tested each year for four years and are still displaying resistance, even without further applications of synthetic pyrethroids. This shows that resistance can be passed on to offspring and is likely to persist in RLEM populations over many years. Since the initial detection near Esperance, the distribution and spread of resistance has been closely monitored by the Department of Agriculture and Food, WA (DAFWA) and cesar. samples collected from paddocks with reported chemical control failures involving RLEM. Mites were collected from each of these paddocks, transported to the laboratory and screened for pesticide resistance. Seventeen samples were screened in 2007, 14 samples in 2008, 39 samples in 2009 and 43 samples in 2010. Twenty-six individual paddocks were found to contain resistant mites. These paddocks ranged over 480 kilometres and were spread across 15 separate properties. The distribution of paddocks sampled between 2007 and 2010 were predominantly from WA’s great southern and south coastal grainbelt regions. The extent of resistance is concerning given the high levels that have been found and the increasing number of chemical control failures involving RLEM experienced by growers. Resistant mites at the majority of these locations have caused significant economic losses due to ineffective chemical applications, mortality of crop seedlings and the cost of re-sowing paddocks. Resistant populations were detected in three geographically separate areas. Six paddocks across three properties had confirmed resistance in an area north-west of Esperance. The majority of resistant populations were located in an area north of Albany; here, there were 19 paddocks across 11 different properties with resistance. The last area known to contain resistance is north of Boyup Brook, where a single paddock was found to contain resistant RLEM. RLEM dispersal predominantly occurs during summer via the movement of diapausing eggs. Eggs may be dispersed long distances by wind, on soil adhering to livestock and farm machinery, and through the transportation of plant material such as hay. Given this movement, it is almost certain that pesticide resistance in RLEM will spread to other parts of WA and probably to other Australian states in the future. To date, extensive screening efforts have not detected resistance outside of WA, although populations from South Australia, Victoria and NSW will continue to be monitored. The situation in WA will also be closely monitored. In addition to screening synthetic pyrethroids, a range of chemicals has been tested using laboratory bioassays. This includes several organophosphates (Group 1B), fipronil (Group 2C), carbosulfan (Group 1A), abamectin (Group 6A) and diafenthiuron (Group 12B). The good news for growers is that resistance in RLEM appears confined to the synthetic pyrethroid class of pesticides. Thus, resistant mites can still be adequately controlled using some registered chemicals such as omethoate, dimethoate and chlorpyrifos. In addition, numerous synthetic pyrethroids have been tested. It is clear that resistance in RLEM is found across the entire pyrethroid group, which has implications for the management of resistant populations in the field. Growers should not continue to use pyrethroids on resistant RLEM populations. This practice is very likely to waste time and money. There are several management tactics available to growers to combat RLEM and minimise resistance issues. RLEM often occur in situations with other mites, such as blue oat mites, bryobia mites and balaustium mites. 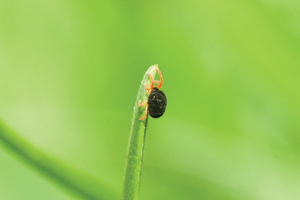 It is important to correctly identify the pest present because these mite species respond differently to registered pesticides, and therefore insecticide products and rates need to be chosen accordingly. The wrong chemical treatment will cost money and only act to increase the selection pressure for further resistance development. Clean fallowing and controlling weeds around crop and pasture perimeters will act to reduce mite numbers. Control of weeds, especially thistles and capeweed, is important, as they provide important breeding sites for RLEM. Where paddocks have a history of damaging, high-density RLEM populations, it is recommended that sowing canola and pastures with a high clover content be avoided. Appropriate grazing management can reduce RLEM populations to below damaging thresholds, possibly because shorter pasture results in lower relative humidity, which increases mite mortality and limits food resources. Sustained grazing of pastures throughout spring to maintain feed on offer (FOO) levels below two tonnes per hectare (dry weight) will restrict mite numbers to low levels. Rotating crops or pastures with non-host crops can reduce RLEM colonisation, reproduction and survival. For example, prior to planting a susceptible crop such as canola, a paddock may be sown to cereals, lentils or chickpeas to help reduce the risk of RLEM population build up. Cultivation can also help reduce RLEM populations by decreasing the number of over-summering eggs. Hot stubble burns can provide a similar effect. Avoid insurance sprays as much as possible. Only use pesticides after careful monitoring and correct identification of pest species. If RLEMs are at damaging levels carefully timed spring spraying can be an effective control method. Further information can be found on the Timerite website (www.timerite.com.au). Only specific paddocks should be selected based on FOO levels, future grazing management requirements and intended paddock use next season. It is important for WA growers to implement a resistance management program immediately and rotate chemical classes with different modes of action to minimise resistance problems. If you have RLEM that survive registered rates of pesticide treatments or suspect that you have resistant RLEM, contact DAFWA personnel or Dr Owain Edwards at CSIRO on 08 9333 6401. Alternatively, contact Dr Paul Umina directly (03 9349 4723, or pumina@unimelb.edu.au) who can arrange a FREE resistance test. Any information obtained from growers or advisers will be kept confidential, and assistance with recommendations for control can be provided if resistance is found. DAFWA, the South Australian Research & Development Institute, CSIRO and the GRDC. This article was adapted from a recent publication written by Paul Umina, Andrew Weeks, John Roberts, Sommer Jenkins, Peter Mangano, Alan Lord and Svetlana Micic, which appeared in the journal Pest Management Science. * cesar is a science-based company that delivers environmentally sustainable management solutions in agricultural pest control and wildlife conservation. Read this article in GC West issue 97 - Subscribe and recieve the hard copy of GroundCover in your mailbox for free, remember to select 'Post' as your subscription method.